Rose and walked Mix. Breakfasted and then joined David who thought we should look for a car for Digger since the one we had gone to see yesterday had been sold before we got there. We went into Duns and found a fine little car which we tried out. It was cheap but the MOT was just running out. We returned home thinking to return in the afternoon with Olive once Digger had had a chance to think about it. Back home David and I ran Mum into Duns for her hairdressing session and on our return David had to go off to return Sasha (his dog) to Jessica (his wife). I set about emptying the Bothy and made really good progress. In the afternoon Olive, Digger, David and I set off to look at the little car. In the meantime I had spoken to Simon (my very knowledgeable-about-cars friend who incidentally was sixty years old today). Simon said that we shouldn’t buy the car without a MOT certificate and that due to the age of the car we should ensure that the timing belt had been changed. At the garage we suggested that we would buy the car if it had a full year of MOT and David said that he would change the timing belt (we are surrounded by mechanical experts). So we left the garage to see if the car would pass a MOT test and if it does I expect that we shall buy it tomorrow. David and I retired to the summer house for coffee before he went home to get ready for the Morris Dancing this evening (at which he, along with Tom, plays the music). Tom meanwhile was driving up from England where he had been at a birthday party yesterday evening. 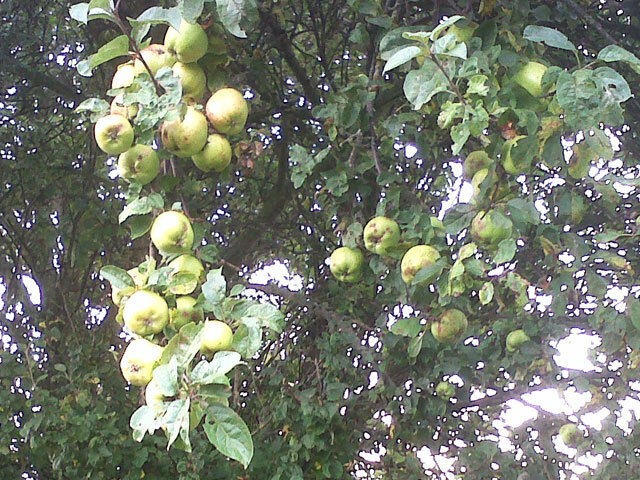 Mix and I walked along Bramble Avenue – I admired the apple tree at the head of this entry. Mum had returned from her Tai Chi class and soon we were all enjoying dinner. Afterwards Mix and I retired to the summer house where I caught up with the cricket and the news before going back in doors and, after a while, walking Mix before bed. It has been a good day – not how I had expected to spend it – but good none-the-less. Every day there seems to be an adventure waiting for us. What more could one ask?